(London 18 May 2016) – If global food prices double then China could lose $161 billion in GDP and India could lose $49 billion, according to a new report released today by the United Nations Environment Programme (UNEP) and Global Footprint Network. The UNEP-Global Footprint Network report, entitled ERISC Phase II: How food prices link environmental constraints to sovereign credit risk, features a table that ranks countries according to how badly they will be affected if global food commodity prices double. In the future, the world will likely suffer from higher and more volatile food prices as a result of a growing imbalance between the supply and demand of food, the report notes. Rising populations and incomes will intensify the demand for food while climate change and resource scarcity will disrupt food production. The report, which was published in collaboration with Cambridge Econometrics and several leading financial institutions, models the impact of a global food price shock on 110 countries to assess which countries face the greatest economic risk from this growing imbalance. Globally, negative effects of a food price shock massively outweigh positive effects in absolute terms. While China could see an absolute reduction in GDP of $161 billion, the highest absolute positive effect on GDP, seen in the United States, is only $3 billion –50 times smaller than the impact on China. In 23 countries, a doubling in food prices leads to a 10 per cent (or more) rise in the consumer price index. Countries with higher sovereign credit ratings tend to be less exposed to risks resulting from a food price spike. Countries whose populations have the highest consumption of natural resources and services, and are therefore most responsible for the environmental constraints that make future food prices higher and more volatile, tend to face the lowest risk exposure. Susan Burns, co-founder of Global Footprint Network and director of its Finance Initiative, said: “Now more than ever, in this era of climate change, identifying all relevant environmental risks is crucial to investing not only in equities but also sovereign bonds. The report builds on the first Environment Risk Integration in Sovereign Credit (ERISC) report published in 2012 by UNEP FI and GFN. The overall objective of the ERISC project is to assesses how environmental risks such as deforestation, climate change and water scarcity affect economies, given that GDP, inflation and current account balances underpin some of the criteria that determine a country’s sovereign credit rating and the cost of borrowing on international capital markets. UNEP and GFN would like to invite interested parties, governments, banks, investors and rating agencies to work with them to further decipher the link between environmental constraints and sovereign credit risk. Today’s ERISC report comes ahead of the release of a landmark report on food systems and natural resources written by the International Resource Panel (IRP), a consortium of 34 internationally renowned scientists, over 30 national governments and other groups hosted by UNEP. The IRP report, which lists a series of solutions that will improve the world’s food system, will be released in Nairobi on 25 May at the United Nations Environment Assembly – the world’s de facto Parliament for the Environment. Global Footprint Network is an international research organization that is changing how the world manages its natural resources and responds to climate change. Since 2003 Global Footprint Network has engaged with more than 50 nations, 30 cities, and 70 global partners to deliver scientific insights that have driven high-impact policy and investment decisions. Global Footprint Network’s finance initiative helps financial institutions quantify and integrate environmental risk in their investments, credit ratings, and country risk analysis. The United Nations Environment Programme Finance Initiative (UNEP FI) is a unique global partnership between the United Nations Environment Programme (UNEP) and the global financial sector. UNEP FI works closely with over 200 financial institutions who are Signatories to the UNEP FI Statements, and a range of partner organizations to develop and promote linkages between sustainability and financial performance. Through peer-to-peer networks, research and training, UNEP FI carries out its mission to identify, promote, and realise the adoption of best environmental and sustainability practice at all levels of financial institution operations. 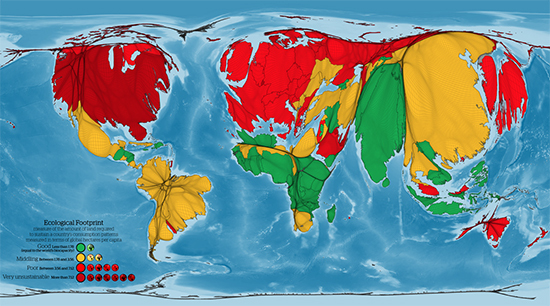 Ecological Footprint data received an eye-opening visual treatment in a recent article in Geographical Magazine, by Benjamin Hennig, Senior Research Fellow in the School of Geography and the Environment at the University of Oxford. Using Ecological Footprint data in the latest Happy Planet Index, Hennig resized a map of the world to reflect each nation’s Ecological Footprint per capita and global population distribution. He then added a traffic light color scheme to reflect the number of planets that would be needed if the world as a whole lived the lifestyle of each country. I had two passions as a kid: nature and technology. 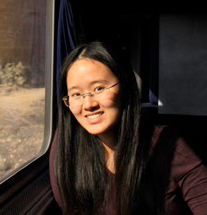 After starting as an electrical engineering and computer science undergraduate at University of California at Los Angeles (UCLA), I realized my path lay elsewhere. 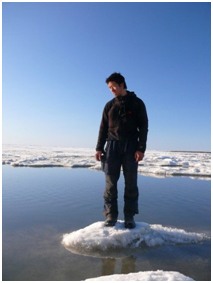 Long before I joined Global Footprint Network as Lead Researcher, my passion for nature led me to Alaska and Russia where, as a Ph.D. student at the University of Texas, I used cutting edge technologies to survey three dozen ecosystems to evaluate how global warming is changing landscapes in the Arctic. 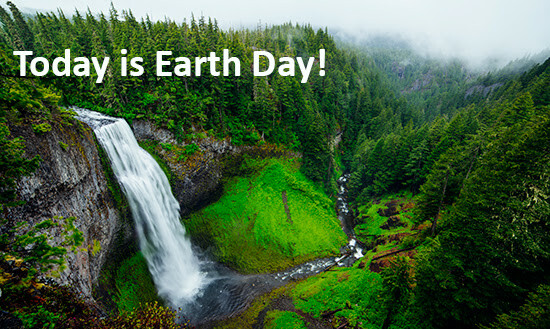 Growing up in Orange County, California, it quickly became apparent to me that an emphasis on material wealth was keeping many of us disconnected from fundamental aspects of our life on Earth, starting with the natural ecosystems we depend on. I ached to have a direct impact on those issues I had come to care deeply about, in no small part through living and working with the communities I encountered near the Arctic Circle and in the desert along the Mexican border. Following my doctorate and post-doc research, I joined Global Footprint Network. I feel incredibly lucky and privileged to play a part in raising awareness about natural resource constraints in the public and among decision-makers. So much work has been done, yet there are still so many promising paths we can explore to make the Ecological Footprint increasingly relevant to communities around the world. I am especially excited by the great opportunity that has been steadily growing in China. The concept of the Ecological Footprint resonates well with Chinese vision for creating a modern Ecological Civilization. Guizhou, a small, mountainous, biodiversity-rich province, where urban development, transportation and agriculture are challenging, is aiming to become an Eco-Civilization poster child with the help of the Swiss government. We’re collaborating closely with the province’s Environmental Protection Department to help leaders along that path. Our next goal is to provide standards that all of China’s provinces can use and share in order to compare results. 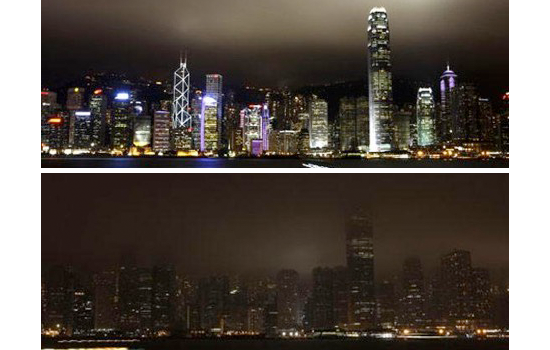 You can support sustainability work in China and around the world by donating here. 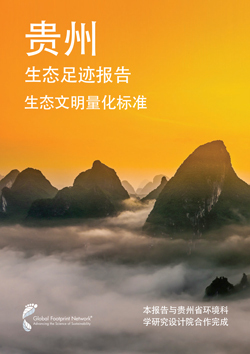 Your contribution could help Guizhou, China’s poorest province, set a precedent and show the rest of the world that it is possible to live well within the means of nature. Your support also could make a difference for impoverished communities everywhere who are beginning to envision their own sustainable future, with our help. Thank you so much for your continued commitment to Global Footprint Network’s work around the world. 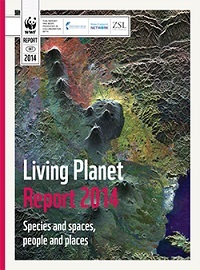 Every two years, Global Footprint Network, WWF and the Zoological Society of London publish the Living Planet Report, the world’s leading, science-based analysis on the health of our planet and the impact of human activity. The Living Planet Report uses the Ecological Footprint and additional complementary measures to explore the changing state of global biodiversity and human consumption. The report documents the extent of human pressure on the planet, how that compares across nations, and how it is impacting the natural world. The Living Planet Report 2014, released September 30, 2014, shows that humanity’s demand on the planet is more than 50 percent larger than what nature can renew, jeopardizing the well-being of humans as well as populations of mammals, birds, reptiles, amphibians and fish. Humanity’s Ecological Footprint has more than doubled since 1961, according to the Living Planet Report. At the same time, vertebrate wildlife populations have declined, on average, by more than half in just four decades, as measured by the Living Planet Index. It would take 1.5 Earths to produce the resources necessary to support humanity’s current Ecological Footprint. This global overshoot means, for example, that we are cutting timber more quickly than trees regrow and releasing CO2 faster than nature can sequester it. 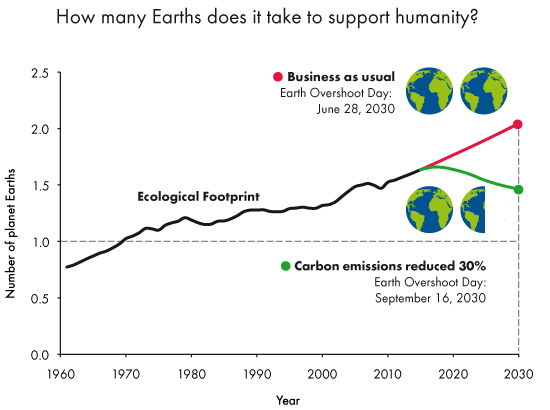 Growth in the Ecological Footprint is largely attributable to the carbon Footprint, which has increased to comprise 53 percent of our Footprint in 2010 from 36 percent in 1961. 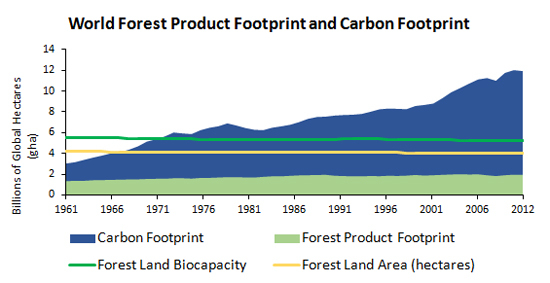 Carbon emissions (in particular) and food demand are the major drivers of the escalating Footprint. 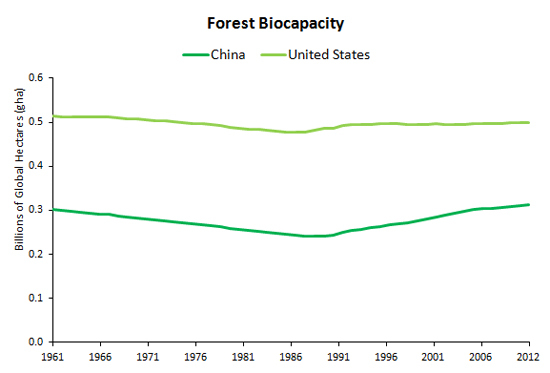 In addition, from 1961 to 2010, the global human population increased from 3.1 billion to 6.9 billion, and the per capita Ecological Footprint increased from 2.5 to 2.6 global hectares. (OAKLAND, CA, USA) — OCTOBER 2, 2014 —A new study published in Science today and co-authored by Global Footprint Network’s researchers reveals that, despite some progress, more needs to be done to reach an internationally agreed set of biodiversity targets by 2020. Ecosystems and the biodiversity that underpin them are vital for sustaining human life. Recognizing this, in 2010, 193 nations agreed on a set of 20 biodiversity-related goals, known as Aichi Biodiversity Targets. Global Footprint Network’s Ecological Footprint is one of the pressure indicators included in the analysis. “Over the past five decades, the biosphere’s ecosystems have been put under increasing pressure due to humanity’s growing demand for resources and ecological services,” says Alessandro Galli, a Global Footprint Network senior scientist and director of the organization’s Mediterranean-MENA Program. Substantial progress is being made on individual targets. Certification schemes for forests and fisheries are becoming more widespread. Policy interventions have resulted in reduced deforestation and led to better managed fisheries stocks in some regions. There is also growing public awareness of biodiversity. Financial resources are being made available to address the biodiversity crisis, but more investment is needed to fulfill all targets. “A mid-term analysis of progress towards international biodiversity targets,” by D.P. Tittensor et al. will be published online by the journal Science, at the Science Express website, on Thursday 2 October. See http://www.sciencemag.org/content/346/6206/241. More information can be found online at the Science press package at http://www.eurekalert.org/jrnls/sci. You will need your user ID and password to access this information. The Aichi Biodiversity Targets for 2011-2020 were adopted at the Convention on Biological Diversity’s tenth meeting of the Conference of the Parties in October 2010 in Nagoya, Aichi Prefecture, Japan. They formed part of the revised and updated Strategic Plan for Biodiversity which provides an overarching framework on biodiversity for biodiversity-related conventions, the United Nations system, and all partners engaged in biodiversity management and policy development. Opened for signature at the Earth Summit in Rio de Janeiro in 1992, and entering into force in December 1993, the Convention on Biological Diversity is an international treaty for the conservation of biodiversity, the sustainable use of the components of biodiversity and the equitable sharing of the benefits derived from the use of genetic resources. With 194 Parties up to now, the Convention has near universal participation among countries. The Convention seeks to address all threats to biodiversity and ecosystem services, including threats from climate change, through scientific assessments, the development of tools, incentives and processes for implementation, the transfer of technologies, sharing information on good practices and the full and active involvement of relevant stakeholders including indigenous and local communities, youth, NGOs, women and the business community. The Cartagena Protocol on Biosafety is a supplementary agreement to the Convention. It seeks to ensure the safe use of LMOs obtained through modern biotechnology and to protect biological diversity from their potential adverse effects. To date, 167 countries plus the European Union are Parties to the Cartagena Protocol. The Secretariat of the Convention and its Cartagena Protocol is located in Montreal, Canada. For more information visit: www.cbd.int. (OAKLAND, CA, USA) — AUGUST 13, 2015 —In less than eight months, humanity has used up nature’s budget for the entire year, with carbon sequestration making up more than half of the demand on nature, according to data from Global Footprint Network, an international sustainability think tank with offices in North America, Europe and Asia. Global Footprint Network tracks humanity’s demand on the planet (Ecological Footprint) against nature’s ability to provide for this demand (biocapacity). Earth Overshoot Day marks the date when humanity’s annual demand on nature exceeds what Earth can regenerate in that year. Earth Overshoot Day has moved from early October in 2000 to August 13th this year. The carbon footprint is inextricably linked to the other components of the Ecological Footprint — cropland, grazing land, forests and productive land built over with buildings and roads. All these demands compete for space. As more is being demanded for food and timber products, fewer productive areas are available to absorb carbon from fossil fuel. This means carbon emissions accumulate in the atmosphere rather than being fully absorbed. The climate agreement expected at the United Nations Conference of Parties (COP) 21 this December will focus on maintaining global warming within the 2-degrees-Celsius range over pre-Industrial Revolution levels. This shared goal will require nations to implement policies to completely phase out fossil fuels by 2070, per the recommendations of the Intergovernmental Panel on Climate Change (IPCC), directly impacting the Ecological Footprints of nations. This is not impossible. In fact, Denmark has cut its emissions over the last two decades at this rate: Since the 1990s, it reduced its carbon emissions by 33 percent. Had the world done the same (while not changing the rest of the Footprint), Earth Overshoot Day would be on October 3 this year. This is not to say that Denmark has already reached a sustainable Ecological Footprint. Humanity would require the resources of 2.85 planets if everyone lived like the Danes, which would move Earth Overshoot Day to May 8. Global Footprint Network is an international think tank working to drive informed, sustainable policy decisions in a world of limited resources. Together with its partners, Global Footprint Network coordinates research, develops methodological standards, and provides decision-makers with a menu of tools to help the human economy operate within Earth’s ecological limits.